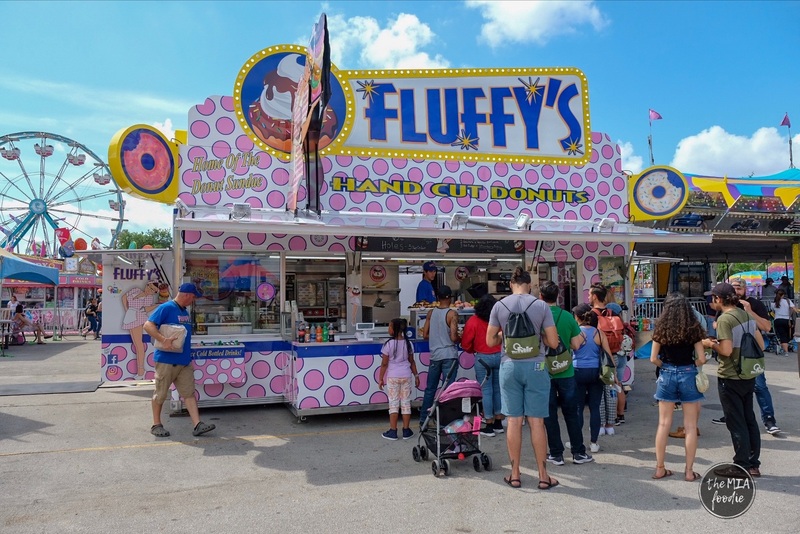 The Miami-Dade County Fair and Expo (also known to us in Miami as The Youth Fair) is finally back with some exciting new rides and food vendors you don't want to miss out on. 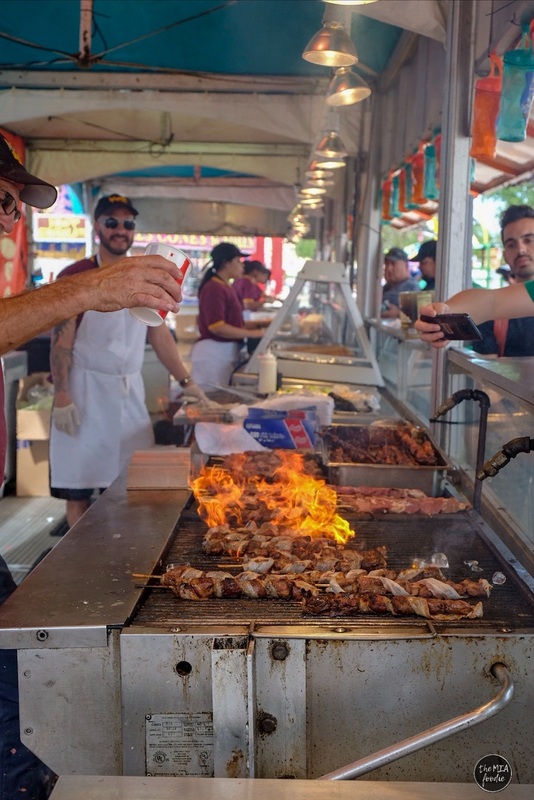 Before we get started on the food tour recap, did you guys know The Fair is South Florida's largest non-profit charity event? Last year alone they provided over 530k in academic scholarships and awards. 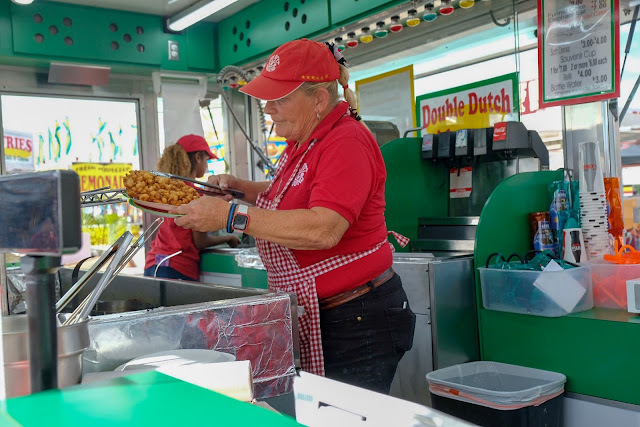 They're also ranked as the highest attended fair in Florida. Pretty neat right? 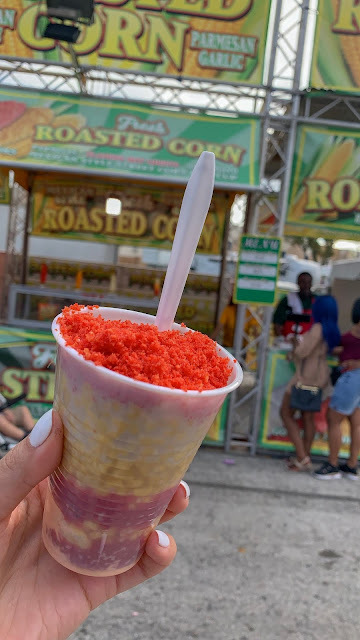 This past weekend I had the opportunity to sample a few vendors, and I've rounded up 10 must try fair foods. 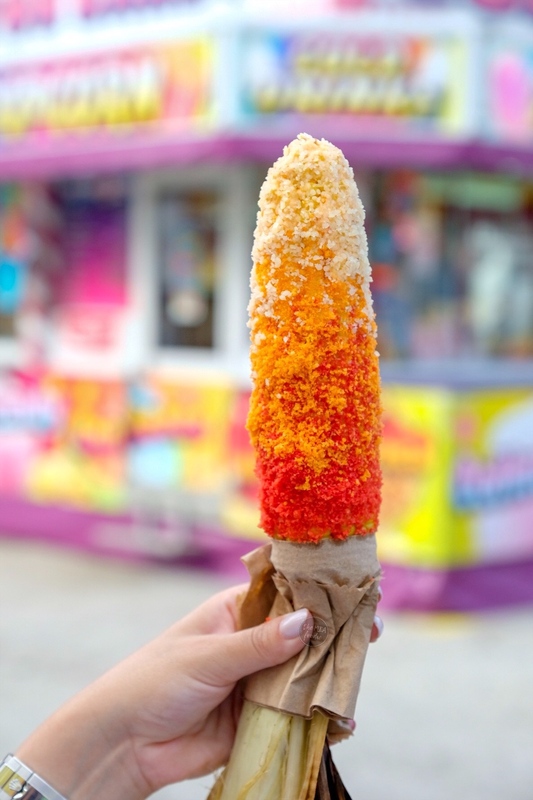 If you're anything like me and look forward to the fair for the crazy eats, I promise you're in for a treat. The first stop on the fair food tour was location 387, also known as "The Meatball Factory" for some shish kabobs- which in my very honest opinion, no trip to the fair is complete without. 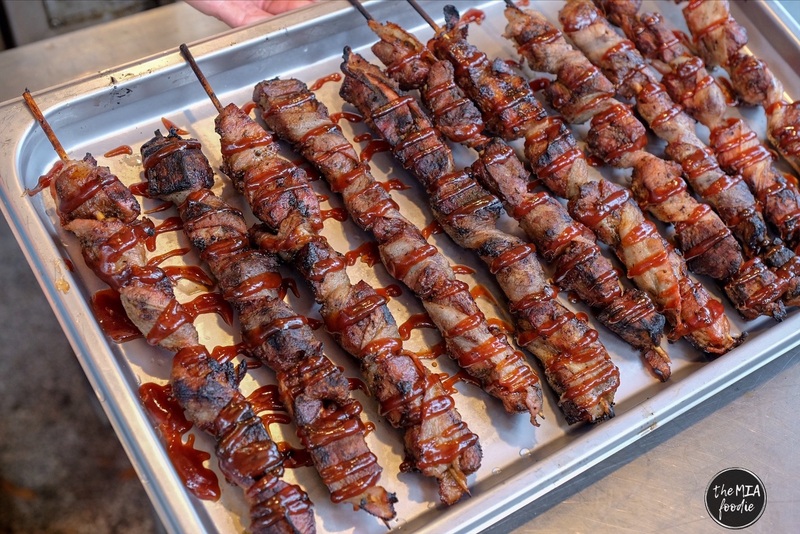 The shish kabobs were made of pork (but there is also chicken available) and wrapped in bacon, yes.. BACON. Drizzled with some BBQ sauce, ugh. 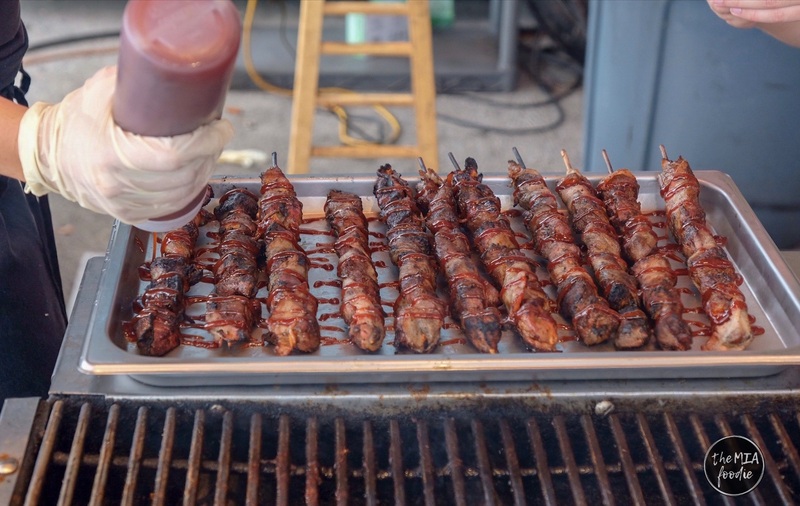 So darn good. 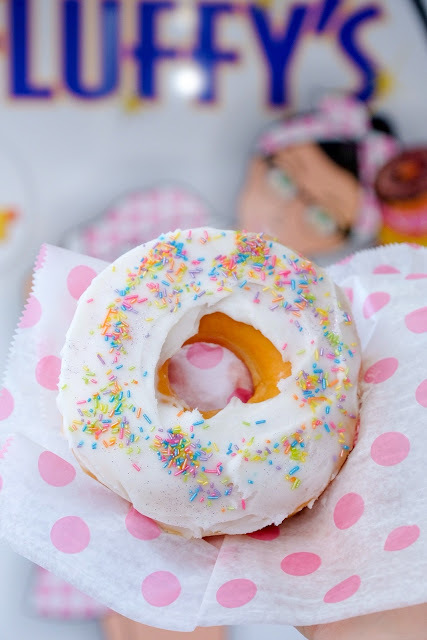 Next up on the list is something a little sweeter, donuts! 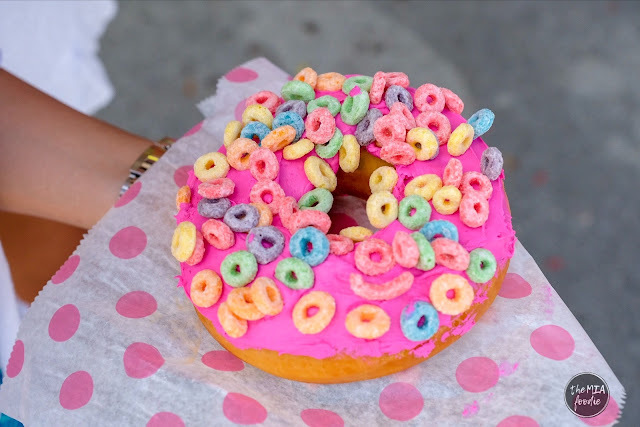 But not just any donuts. Fluffy's in location 354 serves up the biggest donuts at the fair, and tops them with ice cream and chocolate or strawberry sauce. 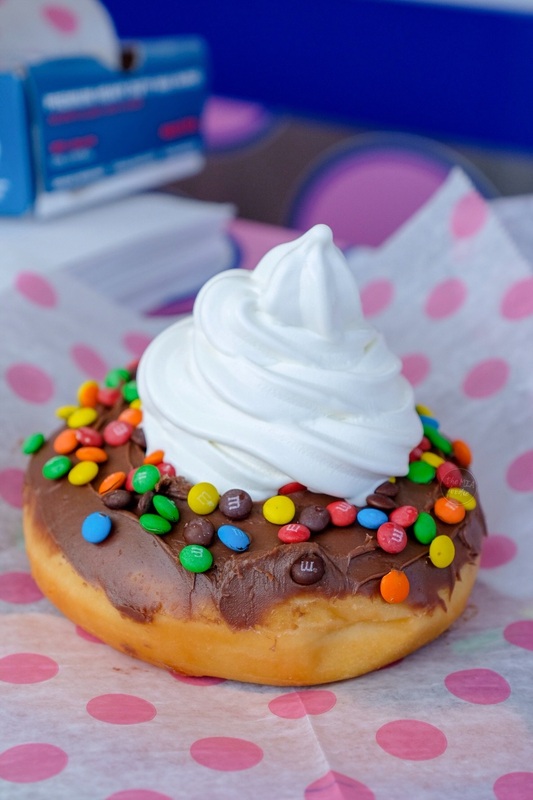 In other words, you're eating a massive donut sundae, I mean.. C'mon. 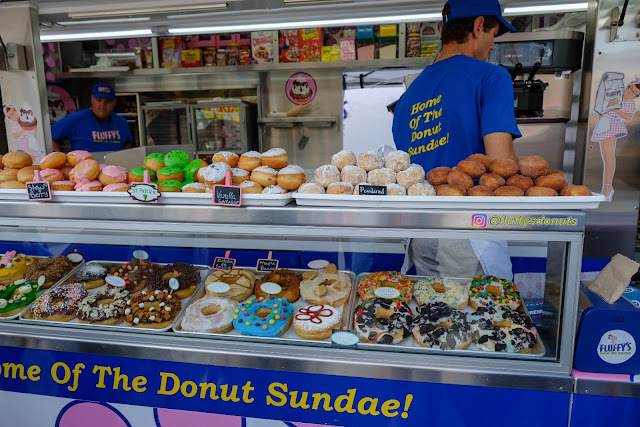 With over 14 different types of donuts to choose from, I guarantee there is something for everyone. 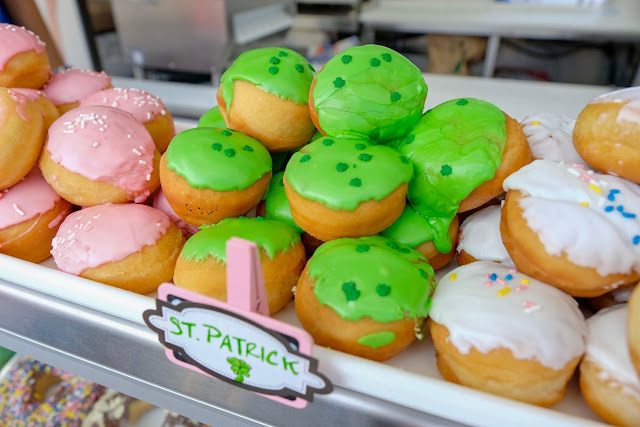 The special of the day was the St. Patrick's day donut because well, it was St. Patrick's day. Alright, we're switching it back up to something salty. Also part of The Meatball Factory, we have location 218. 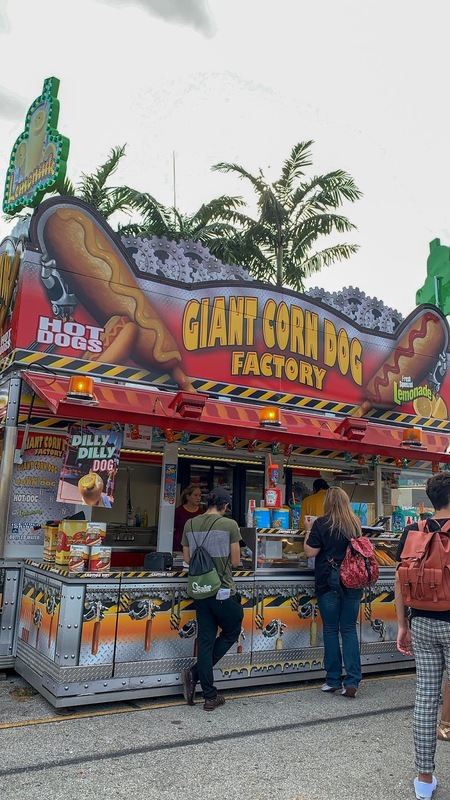 A giant corn dog is one thing.. 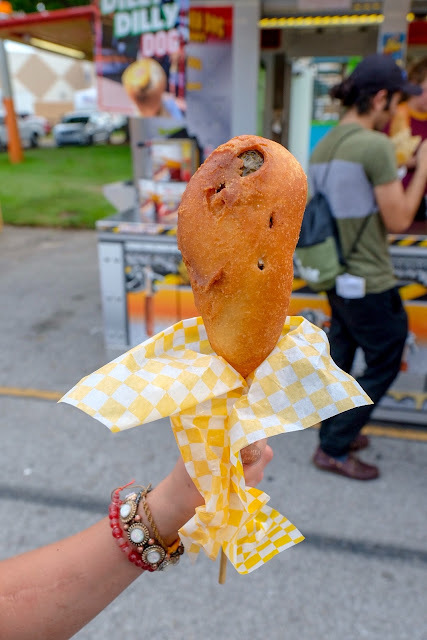 But these are not your average corn dogs, and you'll see what I mean in just a second. 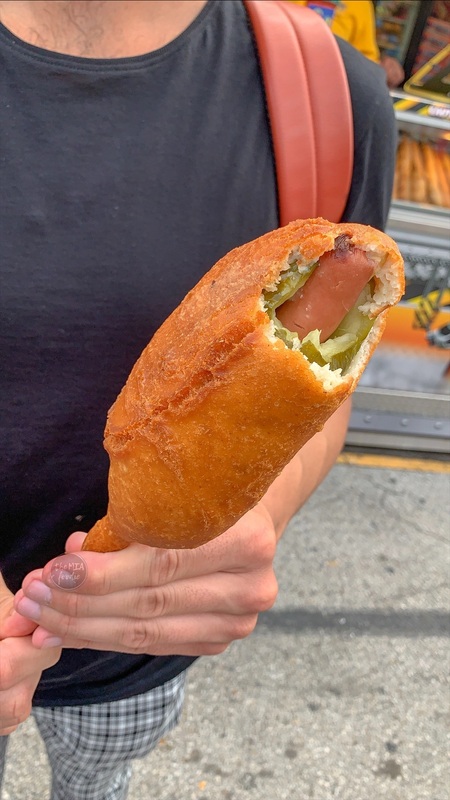 The Dilly Dilly Corn Dog is what were to happen if a pickle and a hot dog made a baby, and that baby was deep fried in a tasty corn dog batter. Sounds crazy right? 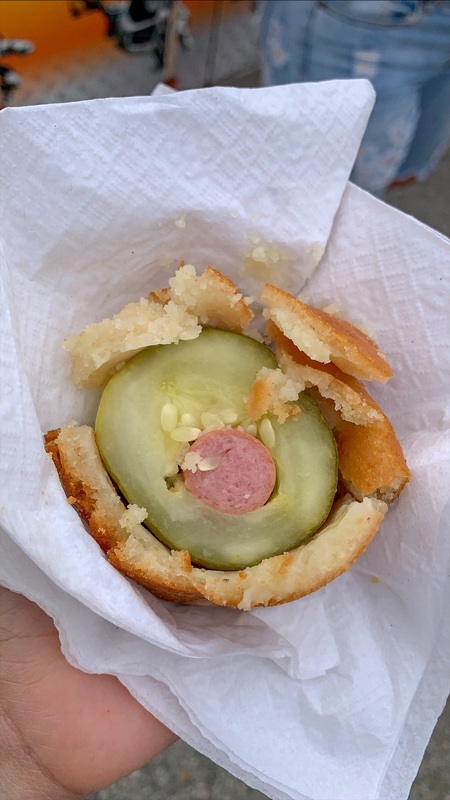 It's literally a hollowed out pickle, stuffed with a hot dog, dipped in a homemade corn dog batter and fried to golden perfection- and you must have one the next time you visit the fair. Just a few steps away from the Dilly Dilly Dog, we have location 222 by Meester Mikes of Coral Gables. 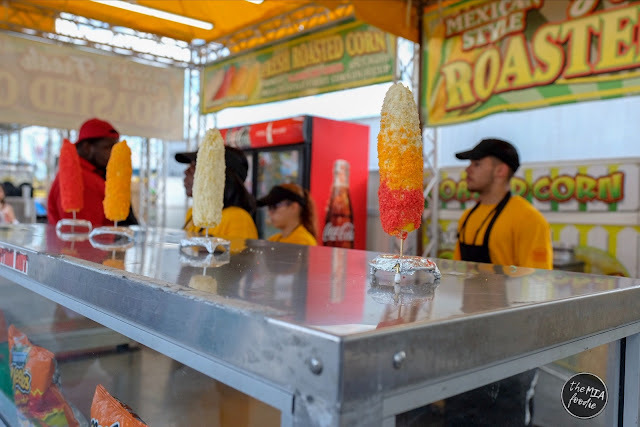 They specialize in street corn, but what truly makes them stand out is their Twisted Spicy Corn in a cup. It's made with layers of corn, flaming hot Cheetos dust and a homemade spicy mayo, with Sriracha and special seasonings. There is also a corn on the cob version, covered in layers of flaming hot Cheetos dust (red), jalapeno cheddar Cheetos dust (orange) and Parmesan cheese. Alright. 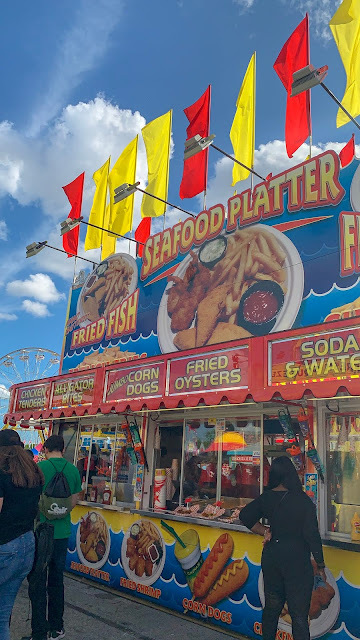 Next up is something I've never had at the fair- Seafood! 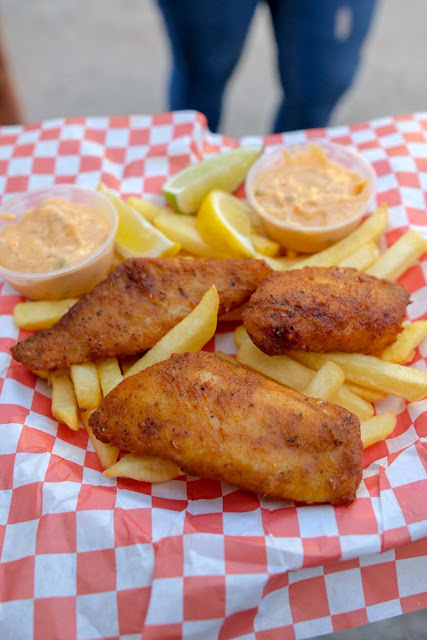 Believe me when I say that I am not a big fan of tilapia, but these Spicy Tilapia Filet's by Atlantic Consessions in location 239 were so good (and hot, so watch your fingers)! 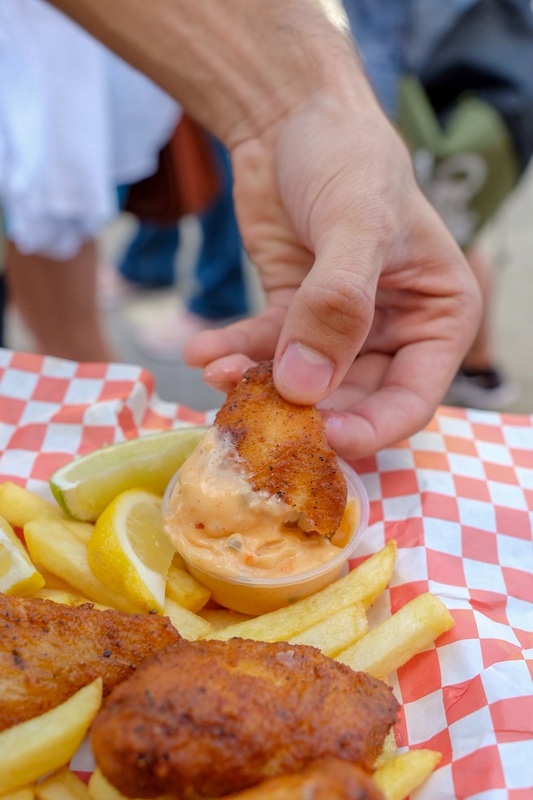 They're served with a homemade Cajun tartar sauce and a side of french fries, yum. And we're back to the desserts! 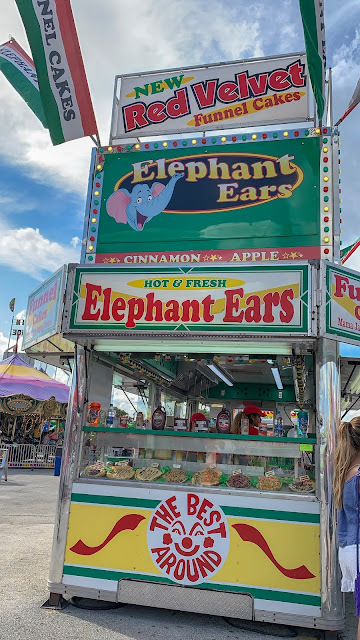 Is a trip to the fair really a successful one if you didn't have a funnel cake or elephant ear? I don't think so. 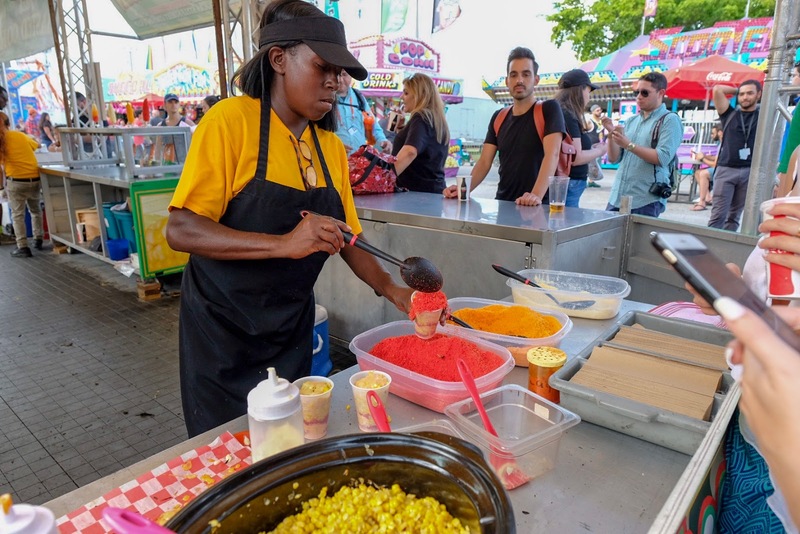 Mama Jane Harris of Best Around Foods in location 246 whips up these delicious creations and they offer over 8 different toppings to choose from. We had the Brazilian Cheesecake flavor, and you can choose between a funnel cake or elephant ear (she made us BOTH). 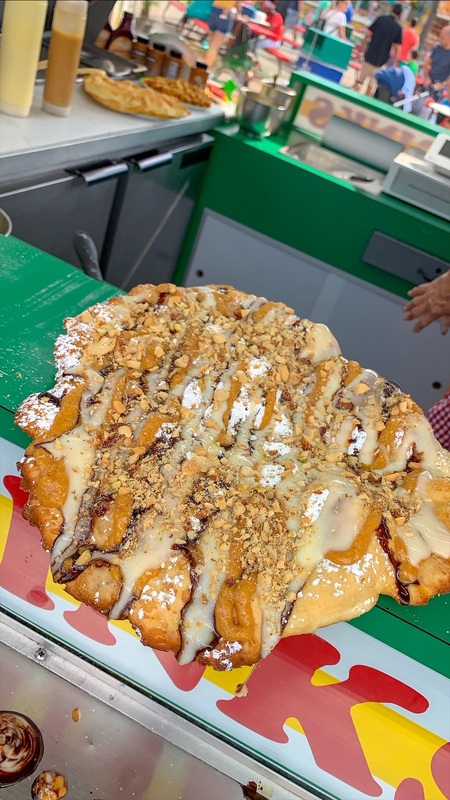 The Brazilian Cheesecake flavor is made with a special homemade cream cheese glaze, chocolate syrup, dulce de leche and a variety of chopped up nuts. 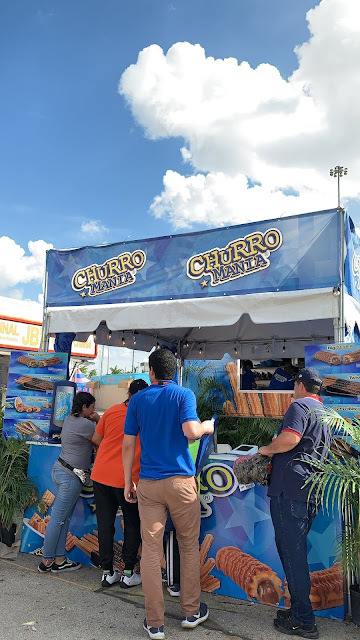 The next stop on our fair food tour is one I've had many times and don't think I will ever get tired of- Churro Mania in location 433! 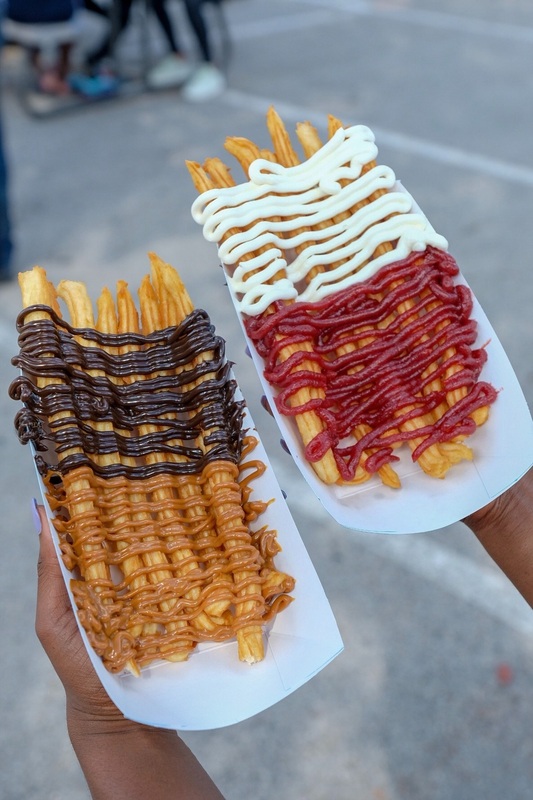 We had the Twist Churros topped with Guava and Cream Cheese. You all know how I feel about guava so I don't think I need to go into details about how satisfying they were.. Also got to try the Chocolate and Dulce de leche, they both were great. Now we're going to head inside to location 737 for Tacos and Crepes. 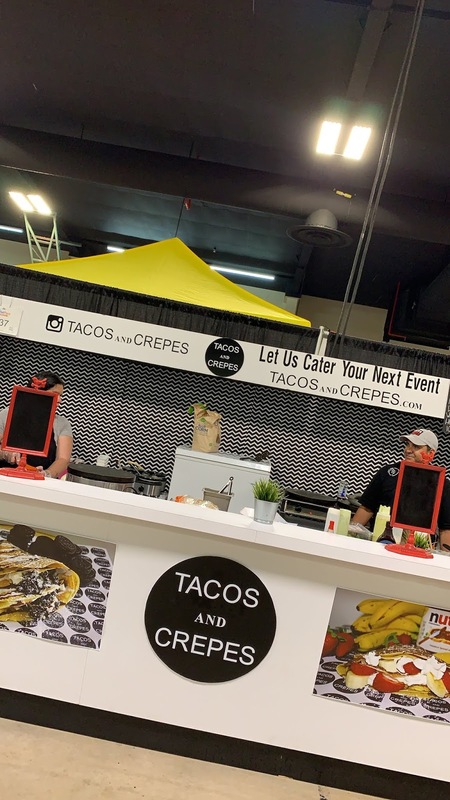 This was also one of my favorite stops on the tour, not for the crepes, but for the tacos! 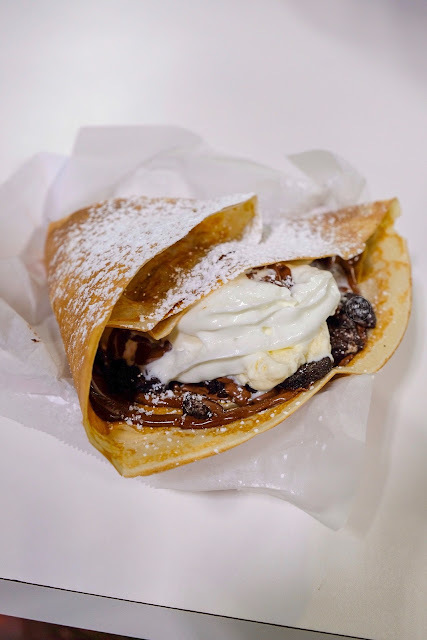 We started off with the Oreo crepe- stuffed with Nutella, pieces of chocolate cake, crushed Oreo's, 2 scoops of vanilla ice cream, whipped cream and topped with a chocolate fudge, white frosting cream drizzle and powdered sugar. 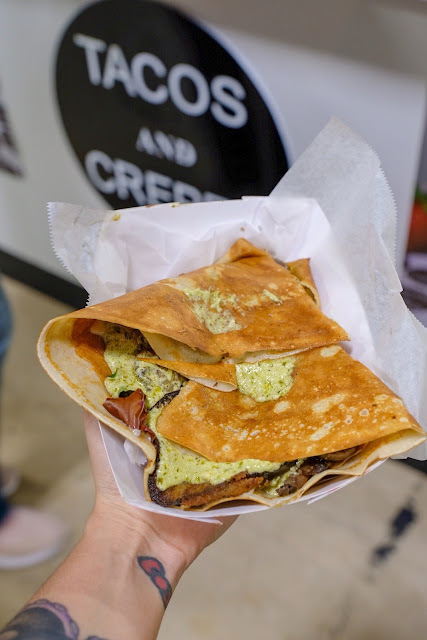 This was the Eggplant Parmesan and pesto crepe and it was to die for. Seriously, it was so good! 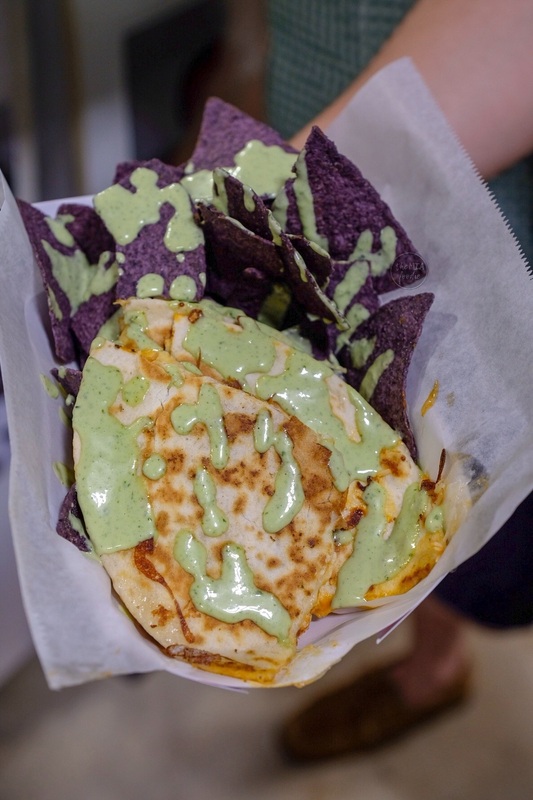 They also made us a buffalo chicken quesadilla.. Fire. 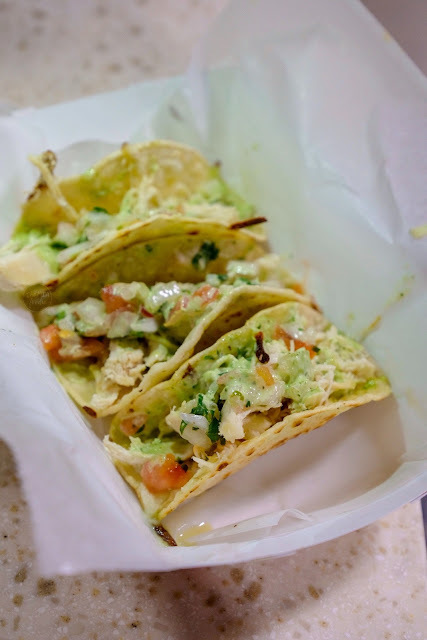 And although this isn't the greatest photo, these little chicken tacos were my favorite item in the entire food tour. I plan to go back to this booth and have them again during my next visit! 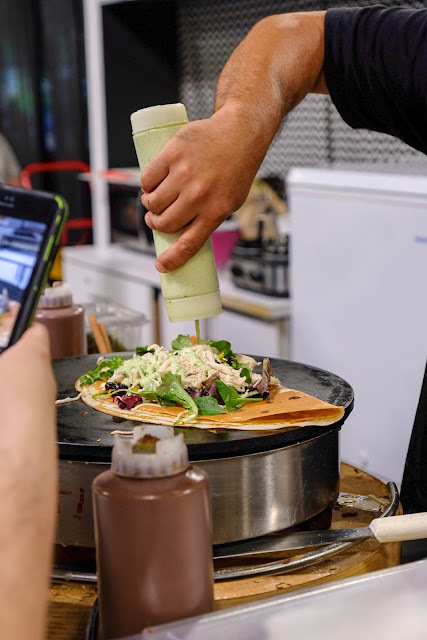 Vegan friends- if you're still reading this, we have something for you too.. 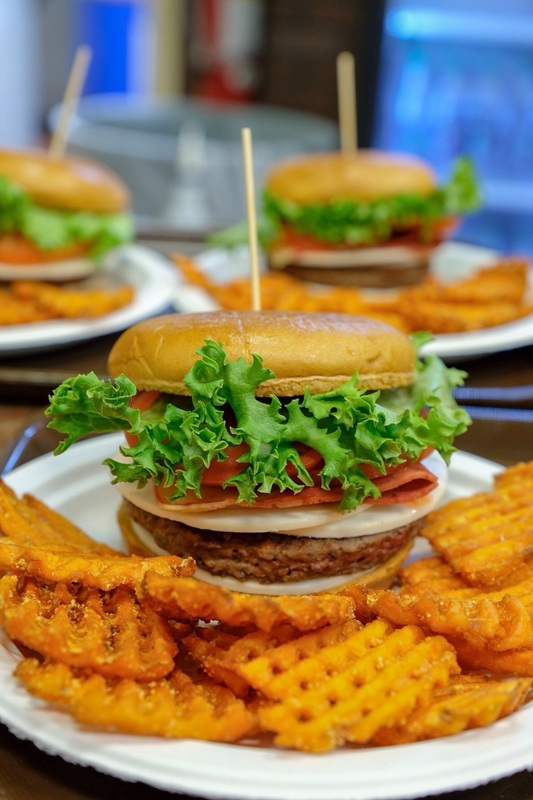 Behold, the Impossible Burger by The Youth Fair's very own Fair and Expo Grille inside the Arnold Hall in location 920. A nut and dairy-free option, made with absolutely no animal products. The burger is topped with your choice of lettuce, tomatoes, vegan bacon, vegan cheese, with vegan mayo and ketchup. It's served with a side of sweet potato fries, and it was so good! Last but not least, some drink's in case your're feeling a little thirsty. 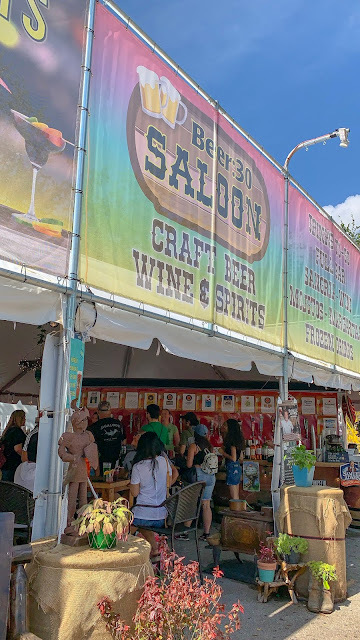 We stopped by Beer 30 Saloon in location 400 and treated ourselves to some beer. I was given the option to make it a green beer in honor of St. Patty's day, so naturally, I did lol. 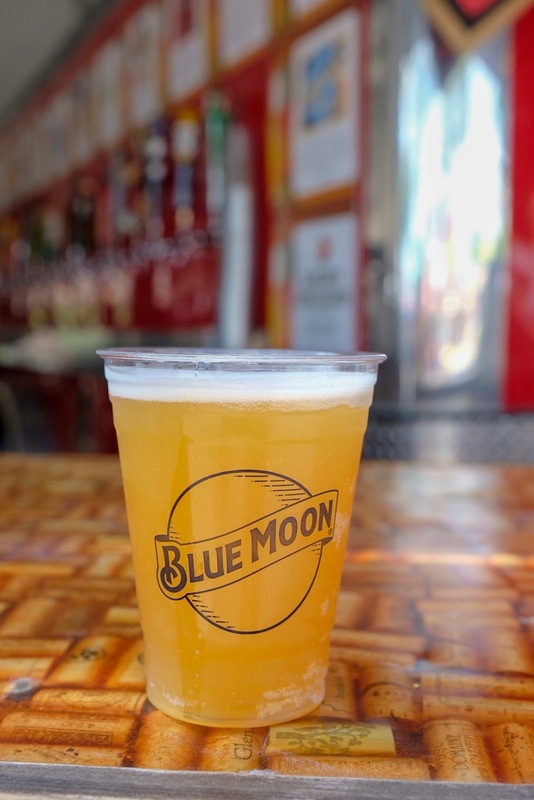 (you can see my green beer in the Fair Highlights on my IG). That about covers it for this year's must try fair foods! Talk about a food coma, I was feeling just like this baby kangaroo by the end of the night.. 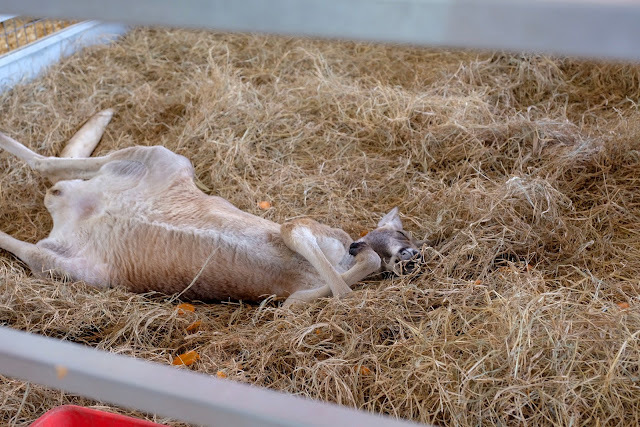 The Miami- Dade County Fair and Expo is open from March 14th through April 7, 2019. 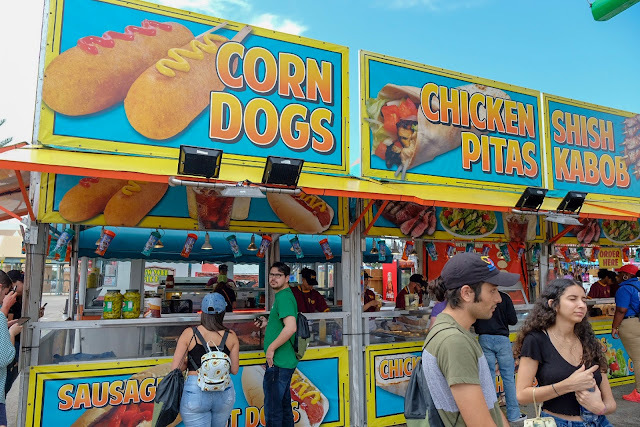 Be sure to take advantage of their next $3 day on April 3rd where you get $3 admission, $3 selected food items and $3 games! 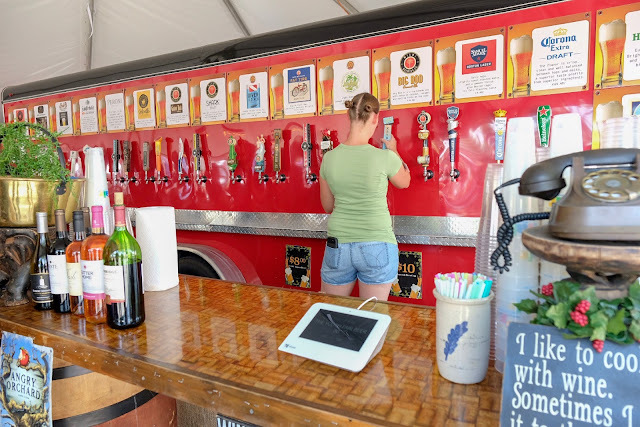 You can also use discount code "BETHERETHEFAIR" to save $2 off your admissions.